Word got out this week that the U.S. Department of Justice will begin looking into the extent to which American colleges and universities use affirmative action in admissions policies – to the detriment of white applicants. There arose a clamor on every side of the issue, mainly because not everyone understands what the issue really is. 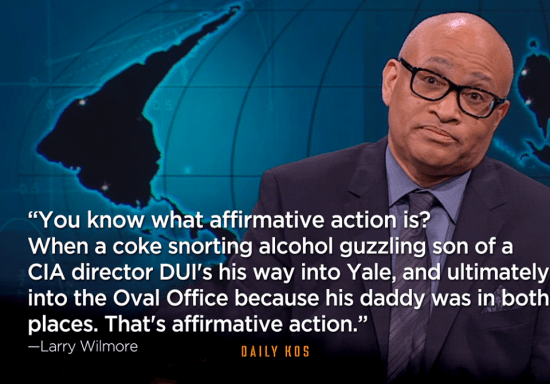 To start, let’s take a look at affirmative action itself. It is widely believed to be a process through which undeserving or marginally qualified black applicants for jobs, college admissions, promotions, or other benefits receive preferential treatment, being hired, accepted, promoted etc., ahead of more qualified white folks. It is also generally assumed to mandate quotas in which a certain percentage of jobs, admissions, and so forth must be given to black people. Thus the first thing we must do is put the lie to those notions. The second one is easy to demolish. Quotas are, to put it simply, illegal. The only instance in which quotas may be implemented is when a court orders them temporarily to correct demonstrated past discrimination. I am not aware of any such orders currently in effect. “But,” goes the argument, “why should things be changed at all? Why not simply keep the system in which the best person is hired, irrespective of race, religion, gender, or national origin?” My response to that argument is this: when was that ever the case? When were those issues never a factor? Certainly not in American history, when until 1964 it was perfectly legal to advertise a job as “men only,” “Christian only,” “no colored,” or any other restriction. My wife’s grandfather was a big-city police officer. How did he get that job? The same way a large percentage of big-city police officers got their jobs. He was hired because he was Irish-descended and belonged to the Knights of Columbus. Neither is “preferential treatment for the unqualified” the definition of affirmative action. Affirmative action is, at its basis, a widening of the search to create a more representative applicant pool. It just says you have to look, not that you have to prefer. In making an active effort to seek out applicants from more than just the traditional places, affirmative action makes it more likely, not less likely, that the best person is selected. In my thirty years of public service, I noticed a huge change from the early days, when my boss plainly said (this is a verbatim quote), “We don’t hire blacks here because they’re nothing but trouble,” to a more open policy in which the best people were found because of outreach to previously marginalized populations. When I was a manager I hired nothing but the best people I could find, and I still had a very diverse work staff, because I made it a point to expand my candidate pool. With DOJ’s new action, there is a great sigh of relief from among those who feel put upon because of affirmative action in college admissions. They can hope that at last this business of minorities (and by minorities they mean black people) getting admitted to prestigious universities at the expense of better qualified white people (although the beneficiaries of an end to racial considerations are much more likely to be Asian-American than white) is going to be addressed by a Department of Justice that is no longer beholden to Those People. There are a few things wrong with this view. One is the way in which college admissions decisions are made. It is not a process whereby applicants are directly pitted against one another and every student who is accepted means another student is rejected. That could never work, because only a fraction of accepted students actually attend any given school, as nearly all students apply to more than one. Thus any given student who is admitted does not “take the place” of another student who is declined. Generally, admissions committees take a look at each applicant and place him/her into one of three piles: Yes, No, and Maybe. The Maybes are given a closer evaluation, and factors other than class rank, GPA, and test scores are considered. This is where affirmative action can come into play. Since the 1978 Supreme Court decision in University of California v. Bakke, racial quotas in admissions are illegal. Non-academic factors, including race, may nevertheless be considered in admissions. That means a school may use race the same way it uses being able to play the bassoon or write complex computer code, being from a region or an economic group not typical of that school’s students, or being an athlete – as a way to diversify its student body, in the belief that exposure to a multicultural environment should be part of their students’ education. And it is unquestionably true that the largest percentage of “unqualified” African-American applicants comes not in the form of affirmative action admissions, but in athletic admissions. Nobody seems to care – indeed, many are thrilled – when an under-qualified (or even clearly unqualified) black kid is admitted to a university because he carries a football or basketball. It is only when he carries just a schoolbook that the complaints of unfair preference arise. Does not that athlete “take the place of some better-qualified white student” in the same way a scholar does? So much for direct affirmative action. There is another form of preferential admissions to prestigious universities that is plainly racial in nature; it just pretends it isn’t because the beneficiaries are white. I do not mean the money-and-connections sort of preference that seems to have gotten admission to Harvard for then-future presidential son-in-law Jared Kushner. I refer here to “legacy” admissions, whereby a university maintains lower admissions standards for the descendants of its alumni. More students are admitted as “legacies” than under diversity protocols, and there is no doubt that such a policy is inherently racist in favor of WASPS (White Anglo-Saxon Protestants). Harvard was founded in 1636, William & Mary in 1693, Yale in 1701. Harvard did not award a degree to a black student for its first 234 years. For Yale, it was 155 years. William & Mary did not even admit any black students until 1951. When Oberlin College opened in 1833 with an open-door policy for black (and female) students, the total number of African-Americans who had ever graduated from American colleges stood at four. After historically-white colleges and universities began admitting African-Americans, the number of them was restricted for decades. In addition, almost all colleges and universities in the United States had restricted admissions for Jews and Asians, as well as Southern and Eastern Europeans and Roman Catholics until at least the 1970s. It was not until the late Twentieth Century that most of the oldest and most prestigious universities in the country began to admit black students in significant numbers, which provokes a question with an obvious answer: If for a hundred or two hundred years or more, all of a university’s alumni were white, who will the vast majority of the “legacies” be? What’s sauce for the goose is sauce for the gander. If you’re going to say race should have no bearing on college admissions, you’re going to have to abolish a self-perpetuating legacy admissions system that rewards the beneficiaries of centuries of racial preference.